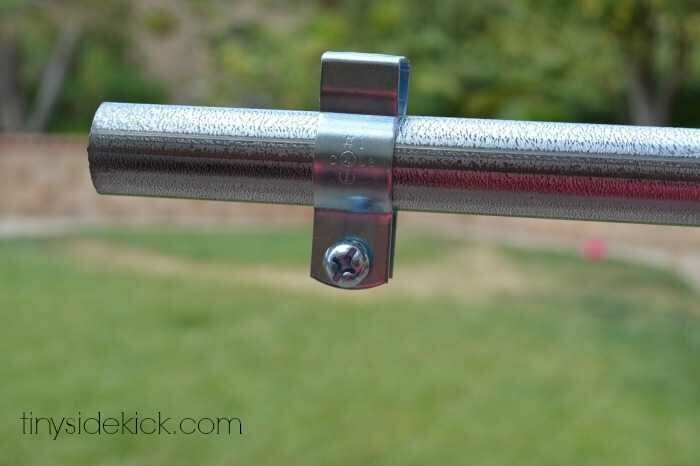 Inside: Step-by-step tutorial to make an outdoor curtain rod that won’t rust. As promised I’m back today to show you how we hung our outdoor curtains with a really inexpensive solution for a DIY Outdoor Curtain Rod. 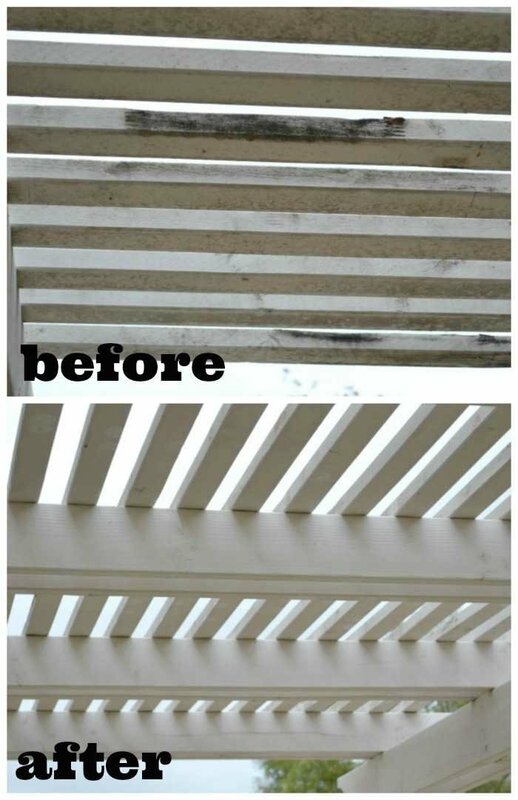 First, I have to say that when we started thinking about the idea of an outdoor living room, I could not imagine relaxing with this grimy patio cover we had going on. I dreaded the idea of having to repaint the entire thing so I set out to find a better solution. I rented a really good power washer from my local equipment rental. Then I put on my scuzzies and made it rain!!! Take a look at what a difference it made! It’s by no means perfect and in fact could probably use a new coat of paint, but we have plans to eventually make this structure a solid top, so why spend the money or the time now? A good cleaning will certainly do for now. There I am in my scuzzies. By the end I was drenched and had the day before’s mascara running down my face. I don’t know what it is about power washing, but it’s thrilling! Like instant gratification watching all that filth rinse off! I purchased my supplies at Home Depot. Did you know that you can actually order your supplies at HomeDepot.com and then pick them up in the store? That’s right! If you hate wandering the aisles trying to figure out what you need you can select your supplies online, someone from the store will gather them for you and you can pick them up! How cool is that? 3/4 in. Conduit: It’s about $6 for 10 feet of this stuff and it won’t rust which makes it perfect for outside. I used the whole 10 feet for my 2 full width curtains and then I had one piece cut for 2 shorter rods. And the best part is you can walk your conduit over to the plumbing aisle and they will cut it for you right there in the store! Geesh I love Home Depot! 3/4 in. 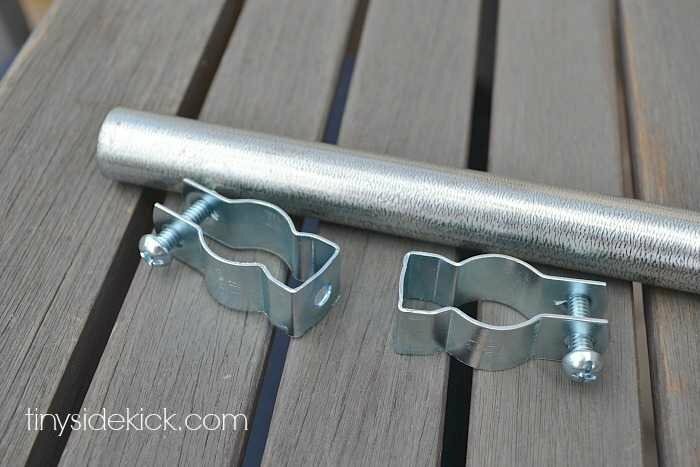 Steel Pipe Hangers These come in a 5 pack for about $3 and are really easy to drill into your patio cover to hold your rod. Curtain Rod Clips– 1 inch. 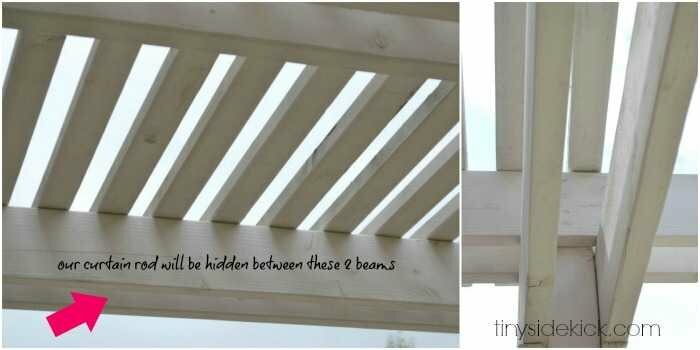 Obviously the placement of your curtain rod will depend on your patio cover, but with mine we have 2 beams, so we decided to hide the rod between the beams. 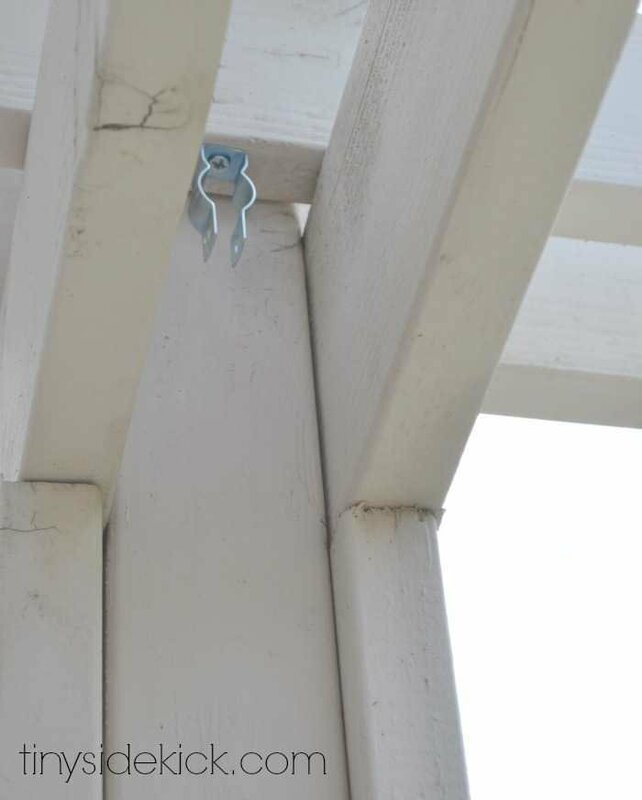 On our short rods we placed the hangers on the main beams of the patio cover. And on the sides with the long rods we hung the hangers a few inches in from one of the top slats to get the placement we wanted. Then, we placed curtain rod clips on each rod and clipped our Outdoor Curtains up. This will make them really easy to take down in the winter too. If you haven’t already, check out how I made these Outdoor Curtains here! See the completed outdoor living room here. Awesome! Happy you found inspiration here! Hey Corey, I think this is an amazing idea. Thank you very much for sharing with us. I can’t wait to do this on my outdoor screen porch! Where did you find the actual clips and rings the curtains hang from? Keep up the good work. Super thanks. Hey Spencer, you will find the clips and rings linked above in the supplies list (click on Curtain Rod Clips). Can’t wait to see how your project turns out! Hi. 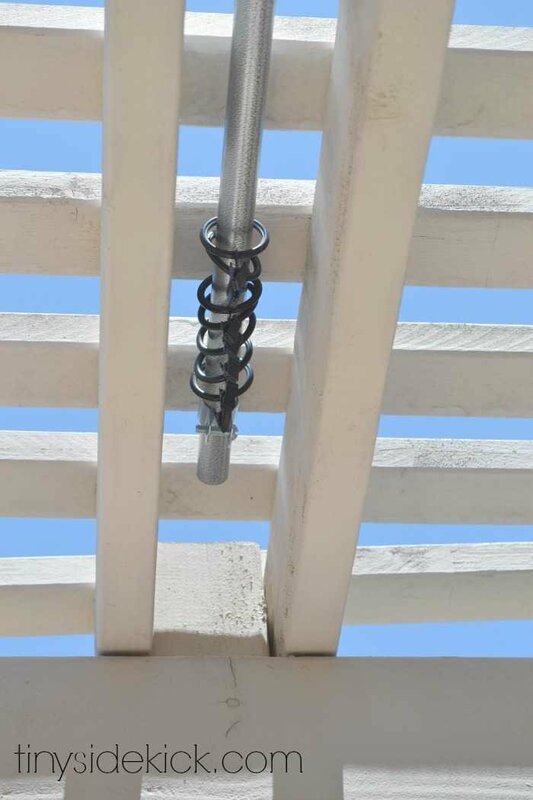 Great idea, except how do attach the rod to a metal pergola? Hi Annette, great question and if you have metal you will need to use a different method. This post might help you! I used shower curtains for my outdoor curtains, they don’t mildew! I tried the drop cloth ideal, mildew is so NOT my friend. Here in Florida, its outdoor spaces worst nightmare. Power washers are a must have. Great tip re shower curtains in humid climes Tammy! I actually used a shower curtain INSIDE my house with great results too, and wrote about it in this post. Am I the only weirdo who absolutely loves using a power washer? It’s one of the very few household tasks that provides instant gratification. I amazed my husband when I suggested we buy one instead of renting when I spotted a good deal in a Costco flyer. Of course, now it’s “my” power washer and “my” job to use it as needed, which in Florida is a LOT. But that’s fine with me. Mold spores — fear my wrath!!! I love to power wash… done it many times! Thank You, it’s simply perfect for our thoughts at the cottage. Your Dad must be VERY proud 🙂 I would be. what is the length of the curtains? and how many panels did you use? this is a great idea that i plan to use this weekend. Hey Marcia, head on over to my curtain post here and get the details on length and panels. Home Depot has the canvas drop cloths and so does Amazon (linked in the supplies list). What a fun Labor Day project! Can’t wait to see how yours turns out! I had to span a 14 ft run for my curtains. Cost was around $60 by the time I purchased conduit, connectors, drop cloths, clips and curtain rings. I cannot get the rings past the screws in the connectors so I guess I will have to take it down and drill some holes in the conduit. Great idea but a little more pricey than your $10 claim. Hey Tammy, thanks for the input. 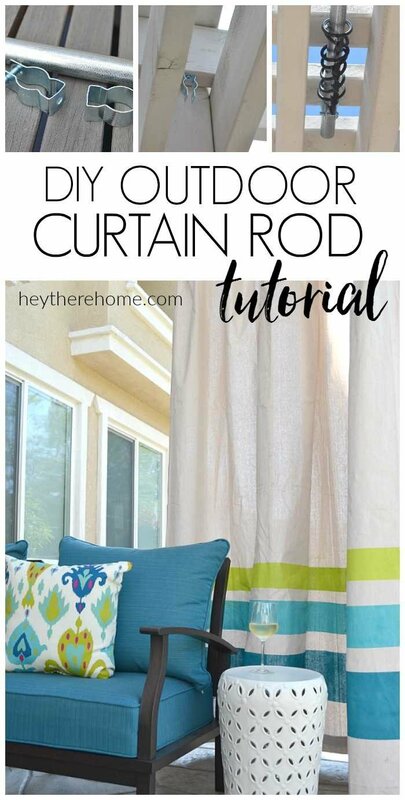 I agree the cost for rods was more than $10; the $10 reference in the first paragraph is how much I spent on the DIY outdoor curtains from drop cloths. Hope that clarifies! I love this idea! however I do not wish to take them down everytime it rains, I was going to spray them with the never wet but was wondering how many bottles did you have to use? thanks! Hey Josee, I believe I used about 2 bottles for the 4 curtains. Best wishes for your project! Is the 10-foot length of 3/4″ conduit strong enough to hold (with one clip on each end) 10 feet of drop cloth curtain (actually it would be more than 10 feet to allow for gathers when hanging), or did you have to add a clip about 1/2-way (at 5 feet)? The “curtains” we will be hanging will be about 6′ long, and we will want to be able to have shade from them about 9′ wide (we will want to “close” the curtains to provide shade, about 9 feet wide). We actually did get away with just using 2 clips, but if you find that you don’t think it is strong enough I would add one to the center or you could bring your 2 clips in from the ends about a foot each to make the stretch between the clips less. In that case you would hang a few your curtain clips on the outside of the clips. Does that make sense? I know this post is already several years old, but I actually thought about making porch curtains several years ago because I am always outside doing some type of crafts or furniture restoring on my porch and my dog is always with me, but he’s a barker. So I thought about using non-mildew fabric shower curtains, but since I would need 8 panels for all my porch openings so my dog couldn’t see everything to bark at, this idea was just too pricey. I did go with the drop cloths, however, I was just curious why you wouldn’t make your stripes using a roller with exterior acrylic paint mixed with fabric medium? If you would have done it that way there would be no fading from the sun or other elements such as the rain and you could safely wash it without losing the vibrant colors. Also paint and a roller wouldn’t be so messy and you couldv’e skipped the entire paper bagC step. That is a great idea. I tend to like spray paint better and they didn’t fade at all in the sun but keeping the vibrant colors when washing would be great. Thanks for the tip I’ll have to try it! Thanks so much for posting this! I followed your directions exactly, except our pergola has two lengths that are longer than 10 feet — on those sides, I used a 1/2″ conduit tube and slid it inside the 3/4″ tube. It worked perfectly! So awesome, Melinda! High fives! I love the idea of the drop cloth for the use of outside curtains. I wouldn’t want to bring mine in every time it rains, could I dye them and leave them outside at all times? Great question, Joy. I live in a pretty dry climate and definitely take them down when it is going to rain. If they get really wet repeatedly mold will start showing up, even if you use dye rather than spray paint. That’s why I made clips so they can be easily removed. I also use a spray by Rust-Oleum called Never Wet and it helps to repel light rain and sprinklers. Hope this helps! Hi Tia, The pics on this page show the top of the curtains hanging. Hope this is what you’re looking for and thanks for stopping by! Hey it was mentioned to be putting a cover over top, any good ideas that will still let light in and minimal maintenance? Can you please clarify your question, Wendy? I’m not sure what you’re referring to and want to make sure I give you the answer you need! Thanks! thank you for the detail here. I’ll be hanging patio curtains like this next weekend. Great tutorial. Thank you! Have you found the curtain clips strong enough to withstand wind? We get crazy strong wind here in MT. Thanks! Just so you are aware. I am an electrician. The pipe and clamps that you are using will rust. Galvanizing is just a layer of zinc to resist rusting but over time that layer will wear off. If you want rust proof. There are 2 applications that you can use. The first is stainless steel, that can get expensive, the 2nd is rigid pvc. That is affordable and application in the industry is for corrosive environments and direct burial. Both of which can be purchased at Home depot or Lowe’s. Hi Brian. Thanks for the heads up. I’ve had mine up for 3 years with no sign of rust at all. So this option is great, especially for the price. I used the same galvanized pipe, repainted with nickel color spray and bought wall mounts at $5.00 a piece but turned them so they were mounted from ceiling. Finished with Wal-Mart stripped curtains for an inside heavenly feel. Would love to submit pics. Where did you find the actual clips and rings the curtains hang from? I would like those same ones. Thanks! Love this tutorial. Hi Erin. You can find them right here. And just FYI for the future, you can always click on the blue words in the list of what I used and it will take you directly to where I bought mine or where you can find similar ones. Would this work as well if you drill the pipe hangers into the side of the porch instead of above? Looking to use this on my deck. Thanks! The only problem is the angle of the hangers. I’m sure if you tell the guys at the hardware store what you are trying to accomplish though they can help you find a part that will do the same thing and have the right angle to attach to the side. I need a curtain rod for an outdoor patio that will need to be at least 15 ft long, any suggestions? thanks! did this yesterday. sturdy and looks great. thanks for sharing! Hooray! Love that this saved you so much money Kaylee! Finally an actual solution for outdoor curtains! My only problem is for my space I would need about 12 ft. Any suggestions on how to do that? It looks great! Hi Aleigh. Do you mean 12 feet tall or wide? This post is unbelievably helpful! I purchased outdoor fabric to make curtains, but didn’t want spend a fortune on the rods. I will definitely be doing this project. Thanks! thanks so much for this!! I had to hang 5 sets so this saved me so much $$$$$!!! You are so welcome! 5 sets…wow. I bet it looks fantastic! Where did you get your great outdoor dining table? Hi Emily. Our outdoor dining table is from Cost Plus World Market about 8 years ago. It was a redish teak color and I sanded it down and stained it with a grey stain made by minwax and I love it! Where did you find your drop cloth? I have looked online and for the size I need, they are quite expensive! Thanks! I found mine at Home Depot (linked in the post.) They don’t always have the 2 pack that I bought but when they do (around this time of year) they are usually on an end cap or separate pin near the paint section. Be sure to ask the paint guy if he has the two packs. Otherwise they are singles for about 10 bucks. Hello. I just put up the process before the curtains and I was wondering how you got the curtains to open and close if the hook was in the way? Hi Sarah. Are you talking about the part that holds the rod? Mine are at the end of the rod, so they don’t interfere with opening and closing the curtains. Does that make sense? Sorry, I just checked “older comments” and you had already answered my questions. By the way, congrats on BHG. I was looking at making outdoor curtains with the drop cloths as well. How have yours held up in the rain? Do you think you could waterproof them? I would definitely bring them in in the rain. That is why I created a curtain rod with clip attachments so it they are easy to take up and down. However, I found that never wet spray by rustoleum (I think) works really well to repel light rain and sprinklers. Hope that helps! What a great idea. I plan on trying this to make a small space near my shed look cozy and private. Oh my gosh! U must have the coolest house ever! I am deeply lusting your blogs! Thanks for all the detailed instructions! It really helps a DIY novice like me. Thanks Heather! The clips sure do make them easy to take down when the weather is yucky! Very cool! I’ve always wondered how curtains could be hung in a space like that… Thanks for sharing! The curtains look great especially with the coordinating stripes of color you added! Thank you so much for sharing! I can’t wait to do this on our outdoor screen porch! I have been wanting to add some sort of curtain to make it seem more cozy. Pinned!